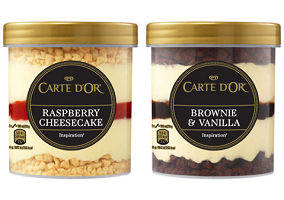 Unilever, the Anglo-Dutch consumer goods giant, is set to expand its Carte D’Or range in the UK with the launch of new layered ice creams featuring cake and biscuit pieces. Said to be backed by a marketing investment of £3 million ($3.9 million), the new range comes in the varieties Brownie and Vanilla, Sea Salted Caramel and Raspberry Cheesecake, priced at £3.99 ($5.22) for a 430ml tub. The Raspberry Cheesecake variety is said to feature raspberry sauce and biscuit pieces, while the Brownie and Vanilla variety combines hazelnut cocoa sauce and brownie pieces, and the Sea Salted Caramel variety comes with salted toffee sauce and caramel biscuit pieces. Commenting on the launch, Noel Clarke, vice president of refreshment at Unilever, said: “The launch will bring much needed excitement back into the traditional frozen dessert category and provide consumers with fresh inspiration. We know shoppers are looking for smaller, more indulgent formats, so with a choice of three well-loved flavours to choose from, consumers are in for a treat”.